I hope Lea, over at Silentology, will forgive me from piggy-backing on her review, but she inspired me to watch the movie and now I have to write about it! You should all go check out her blog, either before or after you read my article tonight. First, for those of you too lazy to read her summary, here’s the basics: Mabel Normand is a young girl living on a farm with her hayseed father and salt-of-the-earth mother. She longs for a newborn calf to make the place more homey. When she hears strange noises in the barn, she sees two men lurking in the shadows and panics. She runs back to the house and calls the sheriff, who’s sound asleep in bed. He fires off some rounds to attract the attention of the local volunteer deputies and sends them off to investigate. Meanwhile, Mabel’s mom has tried to enter the house, but Mabel thinks she’s a burglar and keeps her out. Mom thinks Mabel must be held hostage by burglars and goes off to get dad, all the while Mabel keeps screaming into the phone and the sheriff thinks it must be an Indian attack or a serial killer or something. So, he rounds up every able-bodied man and the police force’s one vehicle (an old roadster like something out of the “Wacky Races”) and rushes to the rescue. Sort of. Actually, the car is much slower than the men running and it ultimately breaks down in a cloud of smoke. Meanwhile, mom and pop have so terrified Mabel that she takes the phone and hides in a closet, after barricading the door. They manage to break through and find Mabel, apparently unharmed. The police show up and appear ready to arrest pop for open-carrying his pistol, but then everyone is charmed by the newborn calf in the barn. The end. All of this, by the way, is communicated in pantomime and just two short Intertitles. Now, this movie gets a lot of attention because of its early use of the “Keystone Kops” (or “Cops”), but that’s only incidental. Only a couple of the volunteers and the sheriff himself have any traditional accoutrements of office, the rest are just yokels with shovels, pitchforks, and rifles. The more “traditional” Keystone Kops movies, like “Fatty Joins the Force,” always take place in urban environments, and they exploit the police-as-authority-figure trope to humorous effect. This one barely scratches that surface. Forgive me, but I think something else is at work here. And, I think I know what it is. Longtime readers who were paying attention might have thought the plot outline sounded…familiar. To spell it out: It’s a very close parody of “The Unseen Enemy” by D.W. Griffith. 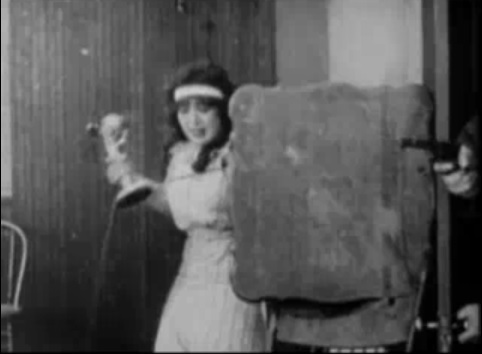 Mabel Normand even mocks Dorothy Gish’s facial expressions in some shots, and camera set-ups are clear parallels. 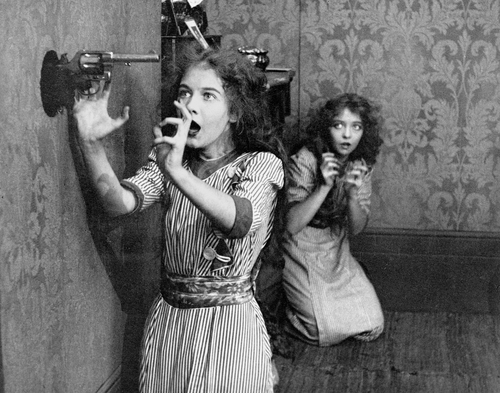 It should be noted that “The Unseen Enemy” triggered a series of imitations, some even by Griffith himself, including “Death’s Marathon.” Even audiences who hadn’t seen Griffith’s 1912 movie would be familiar by now with the story: a young girl, trapped alone in a house, uses the telephone to summon help, while a race to rescue her is intercut with her increasing peril. Director Henry Lehrman (mostly remembered today for not appreciating Charlie Chaplin’s talents) brilliantly turned that whole concept on its head, and used very different camera- and editing-styles from normal to make the satire work. The close-up was generally reserved for opening and closing shots at Keystone, but he needed it in the middle here. Cross-cutting rarely interrupted the story for more than a few seconds, but he needed to draw out the humorous tension of Mabel trapped by her parents while establishing the characters of the titular law enforcers. 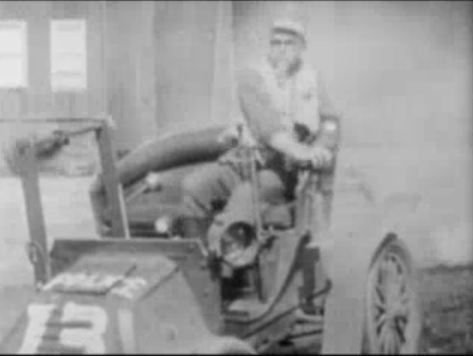 Even the car, which is now seen as the most traditionally “Keystone Kop” element in the picture, is there because it is part of the parody; unlike the original, it is slow and unreliable. Note that Lehrman, as well as Mack Sennett the producer, had gotten their start working as actors for Griffith at Biograph. The one thing I can’t explain is the whole bit with the calf. Wouldn’t a farm girl know if her cow is pregnant? And who are those two guys in the barn? They didn’t look like vets to me, and I certainly didn’t see them deliver the calf. None of this seems to have anything to do with Griffith, I guess it’s just there because they needed an ending. Quite correct about Sennett parodying Griffith. He did it many times. As he later said “I intended to make The Genius’ want to boil himself in oil”. Beyond that there were only so many scenarios: Bad guy vs good guy, us vs them, damsel vs plug-hatted villain etc. Griffith and Sennett played them over and over again., just like everyone else. Thanks for your comment! I’ve rarely seen it so explicitly done, and it was nice to be able to make the comparison as a result of seeing them close together. That’s one of the benefits of this project for me, it lets me see the movies in the context of the rest of early film. Thanks for linking to Lea’s post. 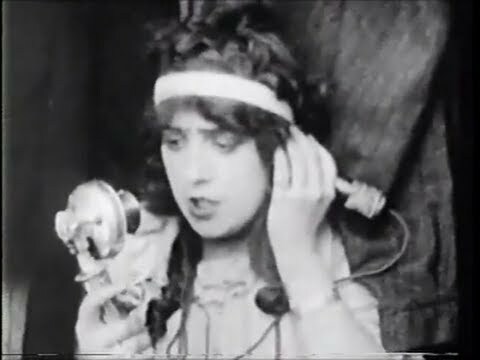 I’d not seen that movie before, and I was excited to see another new (to me) Mabel Normand film. Thanks also for pointing out the similarities between this film and “The Unseen Enemy”. I haven’t seen the Gish/Griffith film, so I’ll track that down and then watch this again. Looking forward to it! It’s a great film, and I think Lea’s review says most of what needed to be said. But, when I realized the connection, I had to write it up as well. Glad to be exposing you to more early movies!